This article originally appeared in The Rosary Magazine, before being reprinted in the Saint Clara Academy, Sinsinawa magazine The Young Eagle, in December, 1899. The lovelier things of life are not always found on the world’s great thoroughfares. It is with this bit of philosophy well realized, that most visitors at Saint Clara Academy contemplate the stretch of shore, or more accurately, the carriage drive from the Mississippi Valley at Dubuque, Iowa, to Sinsinawa Mound, Wisconsin. Everyone who has taken the ride will doubtlessly remember how the persistently uppermost thought, that conventual minds are often peculiarly indifferent to the idea of accessibility, finally gave way to the surprise and wonder that awaited him at his journey’s end. Getting out of the carriage there, after several miles of jolting up and down hill, is in itself quite as pleasureable as perhaps of old it would have been to finish a cruise on the prehistoric sea that washed the country far and wide, and to find one’s self safe and secure on Sinsinawa’s unyielding crest. But the place, with its present revelations of nature uplifted by art, will straightway, absorb the visitor’s interest to the utter oblivion of all his previous woes afoot or awheel. and zinc. In those times there were geological surveys by the government, and towns of great promise were laid out. Men like Generals Grant and Jones, and the well-known poet, savant and scientist, James Percival Gates, once lived and labored not many miles away under that same stretch of the skies. Along the western horizon, where, at dusk, when the last glow of sunset has faded, the lights of Dubuque twinkle picturesquely through a fringe of the mound’s treetops, there is a long, irregular silhouette of rounded hills and beetling bluffs. They mark the course of the great Father of Waters, and it is something to remember that their outlines were once familiar to many a hardy western pioneer, lay and clerical, like Julien Dubuque, Alexander Faribault, General Sibley, Bishops Loras and Cretin, Father Ravoux, and last but not least, Father Samuel Mazzuchelli. Of all days of the year, the fourth of November is a day to spend at St. Clara’s. For then, in the evening, the whole household gathers together to do reverential, filial honor to the memory of their father and founder, to commemorate his almost hallowed name. The event brings about a better realization of the full scope and meaning of the man’s life and of his life’s monument. There one may meet some yet living, whose memory enables them to descry through the mist of years that have elapsed since Father Samuel’s death, his gentle charity, his far-reaching zeal, his fatherly benignty and his simple trust in heaven, his gift of mind, towering and multiple, but never used in purpose of self-exaltation, his strong manhood and the stronger love of God that filled his soul and traced its luminous seal on his features. Not that any one at St. Clara’s will rehearse Father Samuel’s history in cut and dried phrase, as a great man may sometimes be spoken of with empty verbiage. It is no light task there to glean even a modicum of serviceable material, for what one picks up casually, addresses itself, in its subtle way, to the hearts rather than to the intellect. And somehow the good sisters, whom one expects to talk about their own reminiscences of the character and the work of their revered founder, of his personal appearance and habits, and of all those minute details, and delight the soul of worldly hero-worshipers, will draw you into the mystic circle of their own admiration and love, that are averse to writing or speech. A mystic circle, indeed, and its growth keeps pace with the onward movement of time, so many are there gathering within the pale of the gracious work that is instinct as with his own spirit. And sweetly do they feel themselves compassed round by the glowing radiance of his charity, which marked him as a beacon light, to point the way from earth to heaven. It is no wonder that to those who saw and heard him, and to those who have otherwise learned to love him, he has come to be thought one of those chosen souls in whom God causes His attributes to shine conspicuous and wonderful. The associations of his name, the depth and expanse of memories it enshrines, find happy, though inadequate expression in the day that is marked and kept each year as his own by his children of St. Clara. Is there any marvel of the mineral world with a fraction of the lines and mottled masses, the turns and angles, the flow and fall of the mystery that enter into even a day of human life ? And when a marvelous light of humanity takes and makes no note of its own shining, when the years of its effulgence have rolled away into the nevermore, when great scrolls of record might have recounted deeds of usefulness, chivalry and heroism, but hardly a scrap actually perpetuates their remembrance; last of all, when only tradition speaks with a voice enfeebled in traversing long vistas of years and vast fields of action, how really little may be said in the way of fitting homage, how really little remains to give us what we desire most, an insight into inner life and character. But it has its value, even in a rough sketch of the gentle, scholarly, saintly Father Mazzuchelli. He was born of wealthy parents at Milan, Italy, November 4, 1807. Of the character and trend of his time, the boy, Samuel Charles, knew perhaps but little, for his home was one of quiet retirement and dignified refinement. We are told that the loving solicitude of his parents was so carefully exercised that he was never out alone before his sixteenth year. Following so closely upon a period that saw one of the mightiest upheavals the social world has ever known, those years must still have been perturbed by the influences radiating far and wide from the spot where a monarchy was drowned in a sea of blood. But the eyes of that youthful soul, we may well believe, were turned, not upon the darksome shadows of this life, but upon the blazing realities of the unseen world. A boy answering to this description must have possessed a thoughtful, generous, sympathetic temperament. He was too unselfish to be given to unwholesome brooding, too sensible of the feelings of others ever to inflict pain by rudeness or disobedience, too bright of mind not to be thinking the “long, long thoughts” of a child of an uncommon destiny. The key of the mystery of an ambition, whether laudable or otherwise, may often be found in that which is the inspiration of a child’s mental life. Must it not appear highly probable that this little Italian boy, with his quick mind, had an early grasp of the heavenly truth and beauty of the Church of Jesus Christ as symbolized in the grand old Cathedral of his native city of Milan; that his love of music kept him in the pure and genial atmosphere and inspiring solitude of angelic worship; and, not least of all, that the name and fame .of his baptismal patron only touched the fonts of his rich generosity, which later made him in many respects a living image of the great Milanese saint, St. Charles Borromeo ? It would not prove an impossible task clearly to trace a significant relationship between many points of Father Samuel’s character and life-action and these inspiring causes. But it will be sufficient briefly to call to mind the self-forgetting zeal and charity of St. Charles, how unceasingly, himself a model of rare sanctity, he preached and labored for reform within the church, and for the conversion of those outside her fold; how generouslyhe succored the poor; how he walked the plague-stricken streets of Milan, ministering with his own hands to the sad needs of hundreds upon hundreds of the dying; how he built churches and monasteries, convents and colleges and schools; how he watched through long nightly hours of prayer and scourged his own innocent body; how he loved retirement and solitude, and at length died with the Light of Heaven in his countenance. Is it at all strange that these are among the things that helped to shape the Mazzuchelli youth’s fixed purpose of devoting his life to the service of God ? That they left a lasting impress upon his young soul to find new, yet like expression in the works of his mature years ? So it was that under the gentle urgence of Divine grace, the world ebbed away from his pure heart, and of all human wishes and cares not one left a trace in his soul, except an all-embracing, far-reaching, burning desire to be filled with charity for God and his fellow-man. On the pages of Italy’s history, a strange record of every kind and phase of human action, not a few chronicle with glowing eulogy, the confirmation, in 1216, by Pope Honorius III., the progress and rapid expansion of St. Dominic’s Order of Preachers, that nursery of so many men of distinguished sanctity and learning. Truth was its watchword, and it vindicated its right to it by rearing and sending into the world, both cultured and uncivilized, an array of men whose achievements are reckoned amongst the greatest triumphs of the human mind as they are counted amongst the chief glories of the Church of God. Such names as those of St. Dominic himself, of Aquinas, Albertus Magnus and Cajetan, of Raymond of Pennafort, Sixtus Senensis, Hugo of St. Cher, Savanarola, and a host of others representing the highest development of theology and philosophy, of canon law and Scriptural learning, have long been revered in Italy. They are not forgotten after the lapse of centuries and are held today in reverence and honor. In the design of Providence, the youth, Samuel Charles Mazzuchelli, was to be caught up into that mighty movement of teaching and preaching, inaugurated by these apostolic men. Under its forward impetus, without the loss of one of his individual traits, without the sacrifice of one noble aspiration, he was to become in our time what so many of the sons of St. Dominic have been in days that are gone, an ” athlete of the faith,” a striver after eternal justice, and a builder of living temples for the indwelling Spirit of God’s immutable truth. prayer and study and, though he knew it not then, to make ready for the work of his life. The call to that came duly, and the response was meetly given, five years later, when he was twenty-two years of age. The saintly Edward Dominic Fenwick, founder of St. Joseph’s American province of the Order of Preachers, and first Bishop of Cincinnati, was the means, under God, of directing the young friar’s thoughts to the new world. As a writer said in an article in St. Clara’s own academic publication, THE YOUNG EAGLE (December, 1894): ” The young Dominican’s heart was fired with visions raised by the ardent American’s words, of broad countries shrouded in darkness, of idolatry and infidelity waiting for the light of the Gospel.” Must he not then have felt the presence of the golden opportunity of realizing the dreams of his boyhood, whose inspiration was that patron of his, the Saint of his native city ? America was the field that offered him ample scope for the zeal that burned within him as a holy flame, and to America he went with the permission of his superiors and with the blessing of the then reigning Pope, Leo XII. He, himself, in an anonymous brochure on his missionary work, has quaintly told about the difficulties and dangers he encountered by land and sea, on that long, lone journey. Nothing, however, seemed to daunt his courage and his simple trust in Providence. He eventually reached Cincinnati, but not without having once found himself moneyless in a seaport town, and put on his way again by some kindly beneficent stranger of means. Afterwards he made his way farther west to spend some time at the Dominican Mother House of St. Rose’s, Kentucky, then later back to St. Joseph’s House of Studies, near Somerset, Ohio. 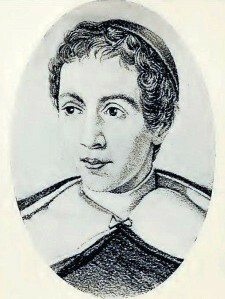 In those days of fatiguing travel, in what was then a struggling part of the wild and undeveloped west, we cannot but think it was providential that the youthful friar met with at least the green memory of the Dominican companions of Bishop Fenwick, Fathers Wilson, Tuite and Angier, the first of whom had attained to rare eminence as a professor of theology in Europe ; and that he came most likely too, a young Levite before his final ordination, into personal contact with such rare old knights-errant of the Gospel, then in the flush and strength of young manhood, as Fathers Hill, the Montgomerys, O’Leary, Martin, Young and O’Brien, not to mention others following nobly in the footsteps of their zealous founder. No doubt these hardy pioneers, bronzed from exposure and inured to every hardship, looked with some misgivings upon their frail, delicate, dark-haired Italian brother. If fhey did, they had not long to wait for proof that his unflinching spirit was equal to all their tutorship, that his soul could assume the strength of steel and band his body with it. For his ordination to the priesthood in September, 1830, marked the close of his studentship and ushered him into the third great epoch of his life, that of a missionary among the Indians and the whites in the far distant outposts of civilization. Think of the zeal that could make so young and untried a priest forget the comforts and refined surroundings of his early home, and joyously endure the rude hardships of a hovel, in the shape of hut or wigwam, far from the society of cultured men, not for any prospect of gain as a venturesome trader might do, but solely for the love of God. If it is a test of courage to abandon home and friends and the attractions of social life and to brave untold dangers, who shall say that our Catholic missionaries have not ever been heroes, of whom we may well be proud ? It is tempting to linger on Father Samuel’s work of years at Mackinac and Green Bay, in all that north country from Detroit to St. Louis, and far up the Mississippi into Iowa and Wisconsin, all wild country then, but now fair and pleasing with its dress and fertile yielding and garnered harvests of nature’s bounty through years of refining toil and cultivation. All this growth and progress and development of today was present to his far-seeing eyes, and, scientist and saint that he was, he made preparation for it that it might the sooner come to pass. And then it was that the resources of his mind burst into their fullest, richest bloom. Hither and to, in much of this vast country, he fared, inducting high prelate and lowly priest into the many churches he designed and built, lending cheerful aid to society and government in instruction, in advice, in the planning of public buildings and schools and the superintendency of their construction. It is well known how he was esteemed as a chaplain of the earlier Wisconsin Legislatures, and how he was sought for his deep interest in the public affairs of Iowa ; yet he was breaking the bread of the word of God for the faithful everywhere, and in his genial way discomfitting the preachers who made bold to misrepresent and oppose him. Publicly busied as he was through that period of westward moving civilization, he was nevertheless a priest of the poor and of the sick, a priest with the welfare of children near and dear to his heart. And our admiration loses itself in mute wonder when we learn furthermore that he yet found time for study, original research, scientific experiment and invention. Whenever he was at his home in Benton, Wis., where he had also established his newly founded community of sisters, he lectured every evening to those noble, self-sacrificing women, taught them, and moulded and shaped their inner life and filled them with his own lofty spirit, that they might be the better equipped for the life’s work he had in view for them. And there, too, it is known that he designed and constructed various scientific instruments and electrical apparatus that was far in advance of his day. It is surely no exaggeration to say that it was purely his own native endowments of genius and foresight that made the present enviable record of St. Clara Academy possible of attainment. For thither his spiritual children transferred the heritage of the broad and progressive ideas on which he founded their community, and which gave it its flourishing growth and development. And can we doubt that the saintliness of his life caused God to bless and prosper his white-robed children, and the children they care for after the kindly, paternal wishes of his own heart ? With all that has been said our picture is inadequate indeed. Many endearing memories might yet be saved before they die out, as the golden irised glory of day pales at sunset. Our final touches must depict a man with a large, open brow, not aged with his fifty-seven years, yet dying. He had been out on a sick call and the exposure brought on the illness that was to end his life. He is propped up in bed, surrounded by his weeping children. He promises them the protection of God, and his own undying solicitude for their well-being. The last words he utters, as his face lights up with the dawn of the next life in it, seem to be an expression of contented rapture at the glory of some vision upon which the eyes of his soul have opened ; “Quam dilecta tabernacula tua Domine ! ” How delightful, O Lord, are Thy Tabernacles. This man was the Milanese banker’s boy, who once loved the glory of a great cathedral, whose soul was stirred with Divine stirrings at the sweet sound of music, whose loving admiration and model was the saint of his birthday, St. Charles Borromeo. There is music of an almost infinitely varied meaning swept out of the pines in front of St. Clara’s stately pile, from sobbing sorrow to unutterable joy, and the ancient oaks on the Mound add their deep pealing tones, either to bemoan their waning strength or to rejoice in the innocence of budding youth disporting itself beneath their branches. If young ears are keenly open to every whisper of nature there, even to catching the inspiration of uplifting song; if children’s eyes are trained to open a way into their fresh young souls for exalting impressions from nature’s illimitable stores of loveliness and beauty, it is because they are gently led to imbibe something of Father Samuel’s spirit, which lingers in the very air they breathe in the halls and in the environments of their Alma Mater. No one has ever been at St. Clara’s without being impressed by the hallowing influences that go thence on wings of prayer and filial piety into some of the best homes of the middle and northwest. No one there has ever failed to experience some sense of the interest and sympathy that go out of the great maternal heart of the Mother House to the children of the many near and faroff ” Missions.” Does not all this add lustre to the glory of Him who compassed the vitality and assured growth of this work in its inception ? Its present guiding spirit and animating energy is a soul after Father Samuel’s own heart. It is not far from truth, if indeed it be short of it at all, to say that in its burden of wise direction and benignant authority, it bears the stamp of a fulfilled prophecy. It is a soul whose crowning gift is prudence in union with the keenest appreciation of the need of the times, foresight of power to meet it, and rare tact in subordinating means to ends in the relationship that yields the palm of ultimate success. Here again admiration is lost in wonder that this institution, with all that it represents, never lagging in the wake of any great movement, but always keeping pace with every fresh impulse or discovery leading to educational good, and often inaugurating and developing higher ideals, has rarely, if ever, had its growth stimulated from without. From humble beginnings, associated in the minds of the truly venerable survivors of early days, with experiences that now seem more like fiction than truth, Father Samuel’s congregation of the Third Order of St. Dominic has attained to its present magnificent proportions of honor and power for good. And still all that delights the eye and occupies the mind to its edification at Sinsinawa, does not seem enough to fill the far-reaching measure of the gently, saintly, scholarly life that touched the Mound and made it a hallowed spot. Does not enthusiasm sometimes become prophetic expectancy ? Perhaps it is no vain dream that carries us onward, this Father Samuel’s day, to the day of added halls, wholly sacred to art and music, of an observatory on the Mound’s historic summit, of a calvary up its slope that will be a religious inspiration, and finally of a memorial church to complete the commemoration of that noble son of St. Dominic, Father Samuel Charles Mazzuchelli. For these are symbols not inapt to crown the already substantial expression of his deserving greatness. — The Rosary Magazine. FRIENDS who knew Father Mazzuchelli pronounce the “Character Sketch” which appeared in the November Rosary so true an estimate of that great, apostolic man, that we interrupt the course of the ” Memoirs ” to publish it. The writer, who clothes his interpretation in such pure, forcible, and elegant diction, is a member of the same Order that claims Father Mazzuchelli. Learned in all the traditions of the Order, gifted in mind as few are, finding ever the highest beauty of thought and intellect, there is a certain resemblance between the young Dominican of the latter part of the century and the grand, older brother of the earlier part. He, too, has a message for the world, for the guerdon of great gifts involves equally great responsibilities. Under the pen name, John A. Raymond, St. Clara recognizes a dear friend, her former honored chaplain, Rev. 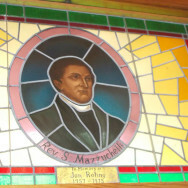 J. R. Volz, O. P.
We are indebted to secretary Thwaite of the State Historical Society of Wisconsin for the cut of Reverend Samuel Mazzuchelli, O. P., which headed the “Character Sketch ” in the Christmas EAGLE. It is one of many kindnesses received from this courteous gentleman, and we trust the new year will bring to him kindnesses one hundred fold.